Pablo Akaros is a Spanish DJ and producer from San Sebastian. His style is highlighted by a dark, eclectic and minimalistic approach. He also experiments with different sounds in a personal way and his new release for 2013 is a retrospective of what he likes most. His first LP at Darek Recordings includes ten original tracks to discover with attention. This time, he offers something different, maybe more mature and present, full of personal experiences. 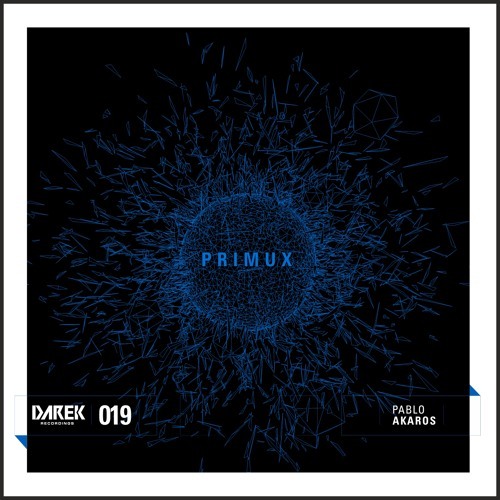 Primux LP is a strong release, with a deeper touch, to savor in its entirety. In 1994, Pablo began to work as a DJ in some local clubs and festivals, with different residences in Spain. Since 2004, his first productions were released at Upfront Records, followed by Meerestief and Intoxik. In 2006, he recorded his first EP on Karmarouge Noir, where he has several references. He also released his music at Miga, Offaudio and Flumo. In 2007 he created his own label Alertha Records, with participations of international artists. Now he’s finally back after a small pause, with some new sounds to enjoy at Darek Recordings.